When Annie was born, as I am sure is the case for all parents upon the arrival of their firstborn, we were showered with gifts. Showered, though, is an understatement. We were literally up to our ears, buried, swimming in gifts. We received packages daily that were flown across the ocean. When family members flew to Rome to meet Annie for the first time, their suitcases were overflowing with gifts sent with them from people back home, many of whom Michael and I had never met before. The amount of love and support we received and continue to receive will never be forgotten. 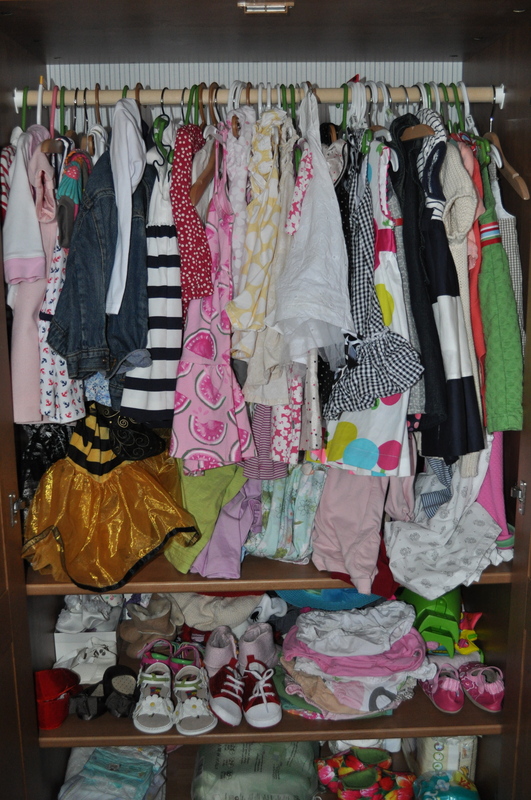 For at least the first two years of her life her closet will look like this…. There are over 60 dresses that currently reside in her wardrobe that are sized 12-18 months. I kid you not. These are only the dresses that currently fit her. This does not include her dresser filled with t-shirts, onesies, pj’s, and pants. It does not include the bins and bins of clothing sized 0-12 months. All gifts! Excessive, of course. But every time I open that overflowing wardrobe, I am reminded of the overflowing love in our lives, the overflowing love for our Annie. And as I dress her each day, I tell her about the person back home who bought her this dress and how much they would love to see her in it. That’s the best part about gifts. It’s not the physical, material thing. It’s remembering the love behind them. Like remembering my parents’ best friends from their time as students in Rome, the Feldners, as we sip wine from the glasses we received from them for our wedding. Or bringing home fresh flowers to fill the vase from “Aunt” Mickey. When I am sick, I immediately go to my tea box and am reminded of my best friend, Danielle, who always took care of me after every surgery in high school. Annie has been given SO many gifts. She has gifts from all over the world. Teddy bears from Berlin, Poland, Annville, PA, and London. Beautiful beads from Jordan and Germany. Handcrafted Italian dolls. Authentic clogs from the Netherlands. 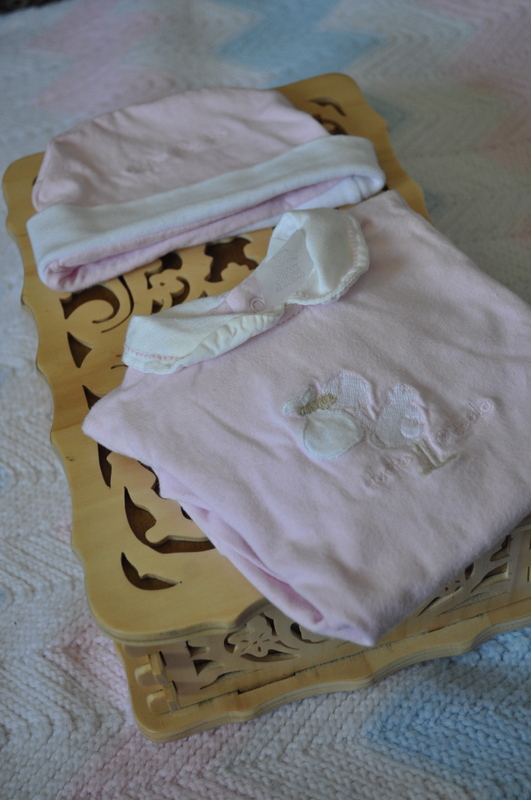 Handmade blankets and booties from Italian grandmothers. Quilts, clothing, toys, and books from the U.S.A. An Italian traditional coral bracelet for luck. A beautiful camel from Tunisia. The list goes on and on. 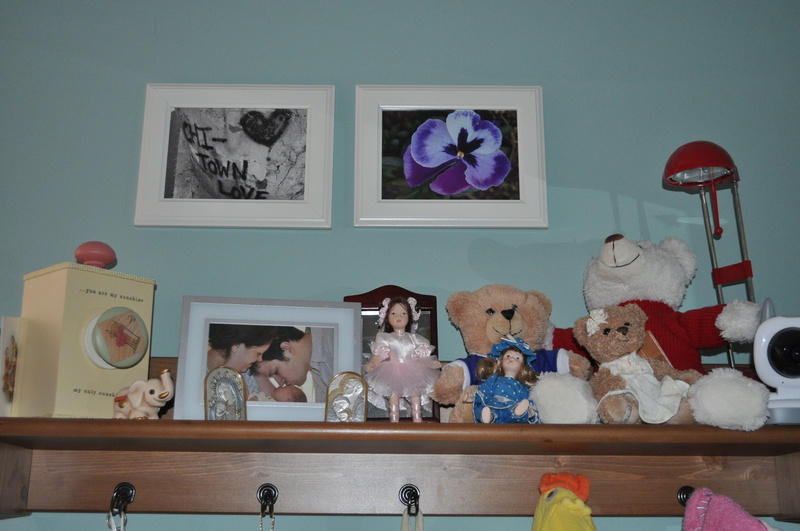 Her room is adorned with them and in each corner is a story for us to share with her of our friend who traveled here or there and thought of her. Sitting among her books, just under her hand painted clogs, is one of my favorite gifts of all. 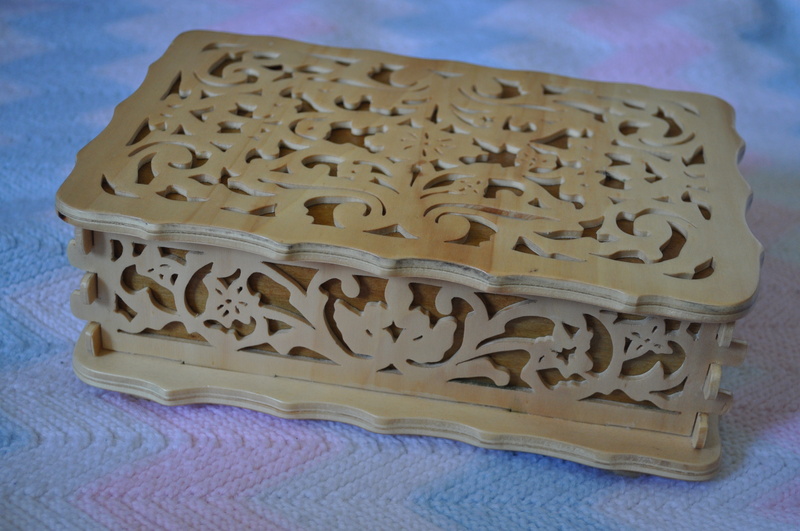 It is a hand carved wooden box. 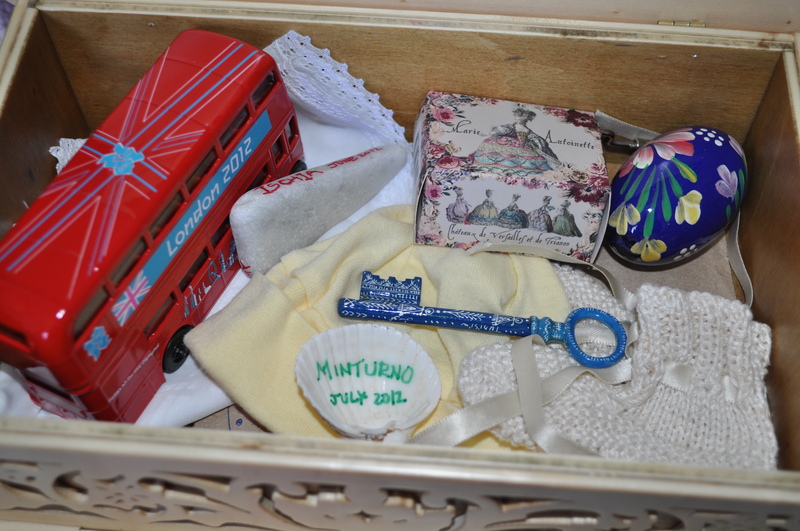 It was made with love by the cousin of our dear friend, Maria, in the small town of Bagnoli Irpino in Avellino, Italy. When Annie was only a few weeks old, Maria presented us with this gorgeous box. The details are incredible. 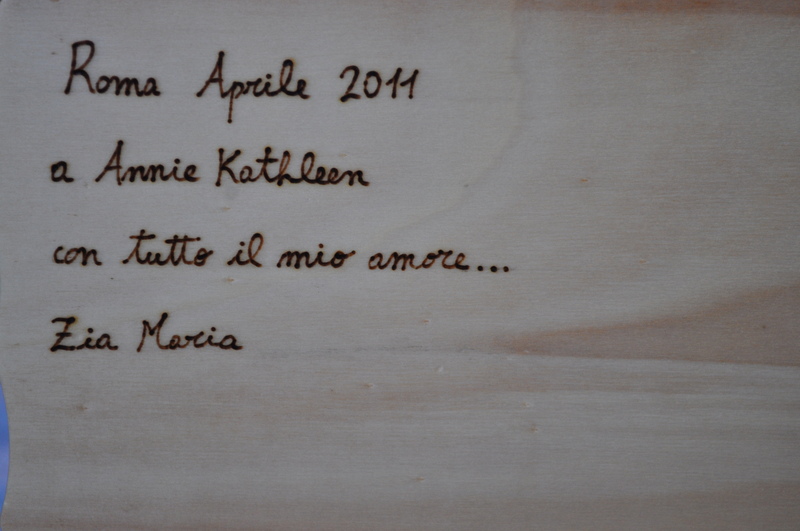 On the inside of the lid of the box is a carved inscription that reads “Roma Aprile 2011. a Annie Kathleen con tutto il mio amore….Zia Maria.” Which translates to the simple message of…Rome, April 2011 To Annie Kathleen with all my love, Zia Maria. Just looking at the box anyone can tell it is special. But having it in my hands I was overwhelmed and thought, “I must find a very special purpose for this amazing gift.” And so it has become Annie’s treasure box. So many times as we meet new people visiting the campus here in Rome, they make the comment, “What a shame! She won’t remember any of this. Of her time here and all her travels.” So we decided to give her a way to remember. 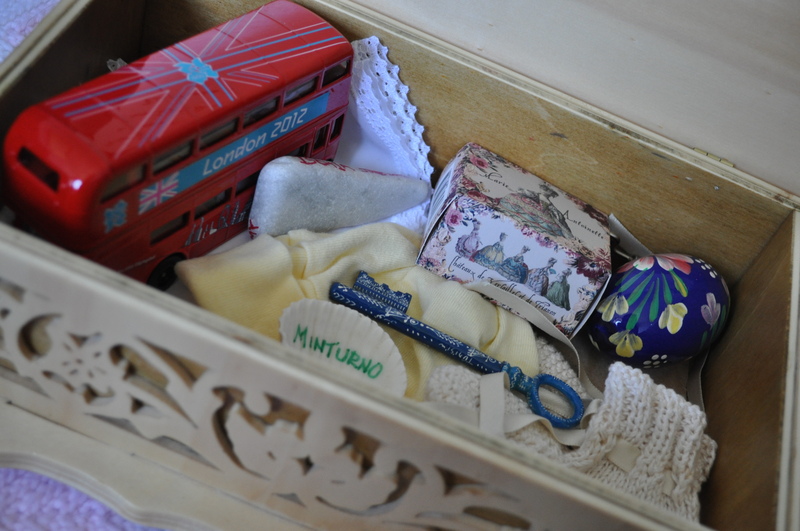 Every time we travel to a new town or country we purchase or find something very small for Annie’s box. This way when she is older, all she will have to do is open the box to remember all the places she has been. So far the box contains the cap she wore the night she was born. This will remind her that she couldn’t wait for Mommy and Daddy to prepare for her arrival and came four weeks early. Her hat, as evidenced in photos, was entirely too big. Underneath the cap, is her “coming home outfit,” a gift from Carla, Anna, Nadia, and Maria. Who all knew Mom hadn’t had the time to purchase one before her early arrival. Because of this, Annie will know that thanks to them, she got to come home in something pink rather than yellow or green or gender neutral. In the opposite corner lies her first pair of baby booties. Italian baby booties are gorgeous and every baby should have a pair. She wore these for the first two months of her life. Folded in the bottom of the box is Annie’s baptismal bib from her baptism at the Vatican. 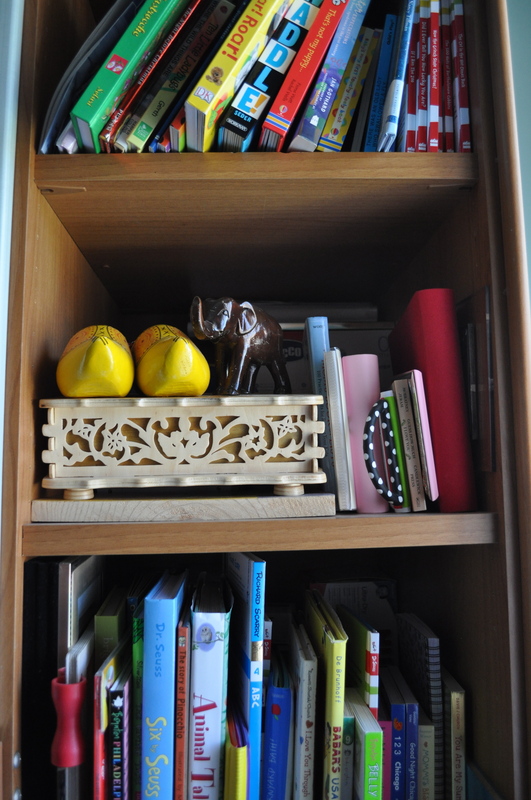 The rest of the contents include treasures from all of the places she’s been. A hand painted egg from Krakow. A double decker bus from London. A tiny hand painted key from Tunisia. A rock from the beaches of Ischia. A shell from the sand on the shore of Minturno. A music box from Paris. (Annie hasn’t been there yet. It is a gift from her Aunt Rachel who spent the last semester here in Rome with her. We hope one day the two of them will explore the Louvre or walk the halls of Versailles Palace together). By her second birthday we have plans to add treasures from Greece and Sicily,and to hopefully add many more. She is only fifteen months and has so many wonderful memories. Yes, we know she won’t “actually” remember them. But we are keeping them for her. Her life already has been so enriched. Yes, by the gifts she has been given. But SO much more by the people behind the gifts. The people back home who love her so much already and from so far away, who have only met her a handful of times. The people here in Rome, who hardly knew her mother when she was born, and that she now considers aunts and uncles. We love you so much. Thank you all for the beautiful gifts, but more importantly for your support and love! Living in Italy has taught me many things. More importantly it’s taught me to appreciate the small things. And when I say small, I mean REALLY small. Everything here is smaller; the homes, the cars, the roads, grocery stores, the portions at restaurants. You name it, it’s smaller. The only thing that’s not smaller in Italy is the churches! Then we moved in. I was six weeks into my first pregnancy. I had just left the only state I had ever called home. I had no friends, no family, other than Mike of course. I remember getting out of the car after Mike picked me up from the airport after a very long and lonely flight. He walked me up to our new digs with my two suitcases. He helped me get settled for a few minutes and then he had to get back to work. I walked around my new house. (It took me a mere two minutes to check everything out). Yep, two minutes. Wow, this is it? We had been left two chairs in the living room and two odd uncovered foot rests. The whole apartment was hospital white with fluorescent lighting. 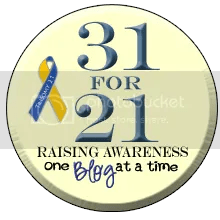 My pregnancy hormones quickly signaled immense emotional breakdown and triggered an unbearable headache. I sat on the floor in my new “kitchen” facing my sink/counter space, next to my four feet tall tiny fridge. My back nearly touched the tiny hutch for storage behind me. I sat and I cried. My crying turned into bawling and hysterics. I cried for the dishwasher I left behind, my stainless steel super sized appliances, the boxes and boxes of fancy wedding gifts we’d received just 10 months earlier, which are now sitting collecting dust in storage at our parents’ places. My husband and I didn’t live together before we were married and we had spent the first six months of marriage making our apartment our “home.” How could I start all over? How could I do this here; with no Crate and Barrel, no Target, no CAR, AND while pregnant and experiencing the worst “all day” sickness ever?! I sat and I cried. I sat on that floor for nearly 2 hours and just cried. (At least I was close to the bathroom for when the pregnancy nausea got the best of me.) I was scared and nervous and all the excitement I had when I learned we would be moving to Italy suddenly evaporated. I wanted my mom and my sisters to be there to help me plan transforming this “space” into my home. Thinking about not having them there for mere decorating purposes made me realize they would not be there the day my baby was born. I had always pictured that day my whole life. The man in the room’s face was always blank (until I met Mike), but my mom and Amalia and Kaylea were always right there. Or at least in the waiting room with my three brothers and Dad. This realization was the onset of even more nausea. I spent days frustrated because I didn’t know where to go to buy things for the house. And then once I would find a place and finally get there they would be closed for siesta! I hated this two years ago. I have learned to love it and that life is to0 important and short to work 24 hours a day. That stores should close for family time. And that, though maybe inconvenient, the Europeans have got it right. Why do we always have to have everything at our fingertips 24 hours a day? What does it hurt to wait til tomorrow and grab your family and go for an unexpected outing, or spend the evening concocting meals from what seemed like an empty pantry, or starving and, instead of moping, having a tickle session on the floor to distract from the pangs of hunger? I learned that having a tiny home is a gift. It forces us to spend our days outside exploring and learning and soaking in our beautiful city. Of course, we make memories in our residence, but home is much more. Home is Rome. It is the tiny cobblestone alleys, the beautiful piazzas lined with artists and musicians, it’s the delicious gelato melting down the side of your fingers on a hot day, it’s the kind neighbors you meet on the autobus you’d never have met had you stayed inside. I pray I can take this attitude back to the states, where things are faster paced and super sized, whenever we move back . That Chicago, or Springfield, or Hersey, or Smallville will become our next adventure with hidden treasures to discover. Our house is our “home”, of course. But it has made me realize that it is primarily a place for sleeping, getting clean, and eating. That memories are made under our roof, but our most spectacular memories are made under the stars. Or under the columns in St. Peter’s Square. Or sitting beside the fountains watching the tourists and feeding the birds. Stumbling upon a surprise concert in front of the Spanish Stairs. Tasting carciofi alla giudea or stracetti con porcini e tartufo for the first time. Taking in the sunset from il parco degli arancia. The most spectacular memories are the small things, the stumble upons. I stumble a LOT in my tiny apartment. I stumbled over the boxes that didn’t fit when we moved here. I stumble constantly over our fold out dining table that hardly fits in the hallway, our “dining room.” I stumble when I try to pass Annie’s highchair (that takes up the entire kitchen) when trying to get to the fridge or the stove. When I stub my toe or feel cramped in my space, we pack up and get outside! Just yesterday, Annie and I packed up to explore and we stumbled upon three amazingly friendly French women visiting Rome for the first time, a five year old boy celebrating his birthday, a new gelateria, and caught the glimpse of a beautiful green parrot in a palm tree. The dishwasher I cried over that first day, I don’t even miss. I would, however, miss all the things Italy has opened my eyes to. That if you don’t “get out there” and experience all the small things your city or town has to offer, your life just passes you by. What will you stumble upon today?